We establish, through solving semi-infinite programming problems, bounds on the probability of safely reaching a desired level of wealth on a finite horizon, when an investor starts with an optimal mean-variance financial investment strategy under a non-negative wealth restriction. of such an event. If x0 > 0 is his initial wealth then we will assume so that the investor cannot achieve his financial goal by simply placing his initial investment in a bank account. 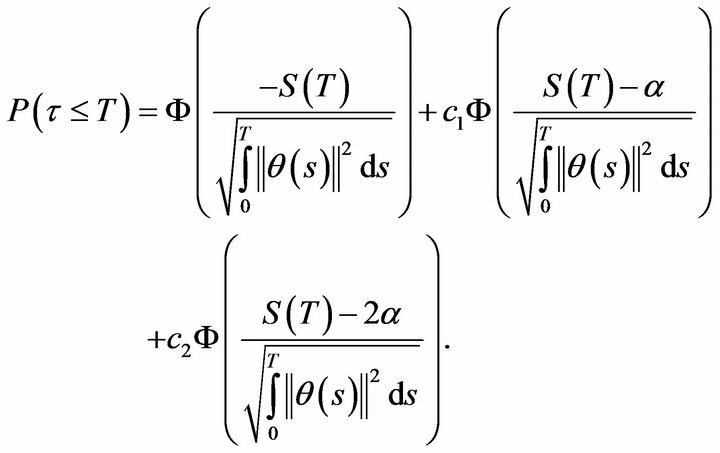 where is a standard m-dimensional Brownian motion. These are known as mean-variance problems and are considered the cornerstone of modern portfolio management theory which originated with the work of Nobel Prize laureate H. Markowitz. is the cumulative density function of a standardized normal distribution. Detailed proofs can be found in Li and Zhou  and Scott and Watier . Evidently, an explicit form for the corresponding goalachieving probability as in the cases discussed in Section 3.1 appears unrealistic. However, we will show that we can obtain precise bounds for this probability through solving (deterministic) semi-infinite programming (SIP) problems. The basic idea is to convert the original passage-time problem of this complex stochastic process with a fixed barrier into an equivalent passage-time problem for a simple Gaussian Markovian process but with a timevarying boundary. To this end, the following result will be useful. is a strictly increasing function on the real line that takes on values in . The next task at hand is to find suitable boundaries, for this, we need to recall first passage-time results for Gaussian Markovian processes through a specific family of time-varying boundaries known as Daniels’ curves (see Dinardo et al. ). For inquiries on efficient techniques for solving these SIP problems we refer the reader to Lopez and Still  and Reemtsen and Rückmann . 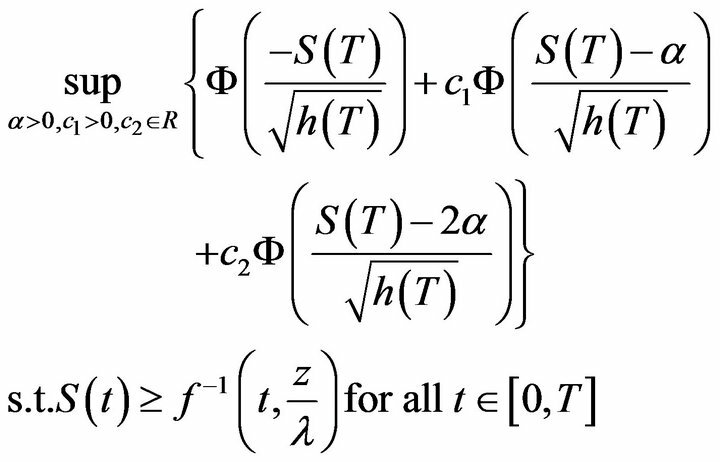 In order to illustrate that the solutions to the 3-parameter SIP problems can produce tight bounds, let us reprise the one stock market model example in Bielecki et al. that is but with different wealth objective z. Table 1 sums up the results. Finally, we can easily show that the 80% rule (i.e. 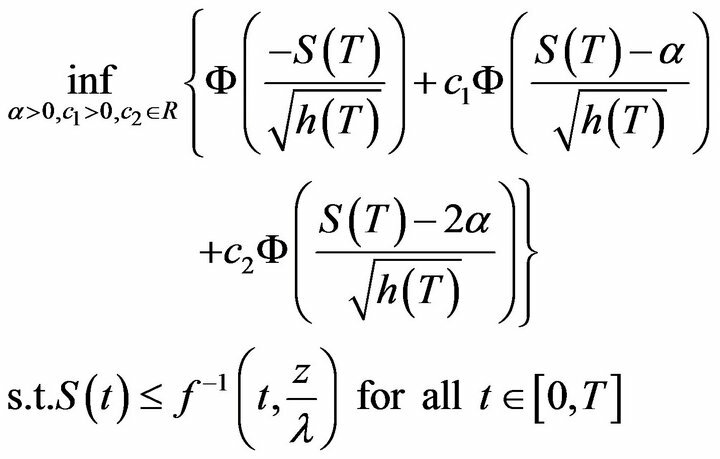 , for all possible values of the market parameters) obtained by Li and Zhou and, Scott and Watier unfortunately does not hold in general for a nobankruptcy optimal mean-variance strategy. For example, if we set , by solving (29), we have . Table 1. Goal achieving probability bounds. mous referee for their helpful comments and suggestions. Grant Sponsor: Natural Sciences and Engineering Research Council of Canada. R. Reemtsen and J.-J. Rückmann, “Semi-Infinite Programming,” Kluwer Academic Publishers, The Netherlands, 1998.